Tomorrow is my birthday. I’ll be 48 years old. Today I’m 47 years, 11 months and 30 days old, so I’m not too worried about adding the extra 24 hours onto that total. And the alternative is highly unattractive. This morning I took the dogs out at dawn and got to see the sunrise. The sky was this amazing midnight blue with one perfect star high up in the sky. Through the tall, snow crusted pine trees I could see this band of vivid color as the sun rose. Spectacular. 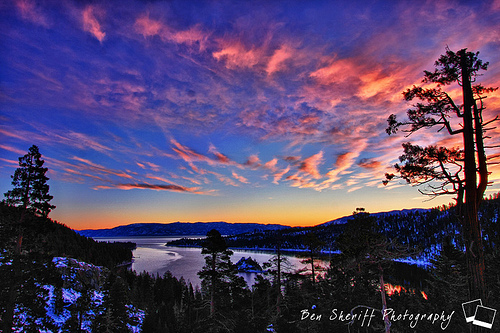 This photo by Ben Sheriff Photography does it justice, but still, you had to be there. Hope it’s nice for my birthday tomorrow – I’m taking a snowboarding lesson if the wind lets up and the lifts open. You know the expression “March roars in like a lion”? Well it’s a whole pride of lions outside right now. I’m up on a hill and it’s quite breathtaking – literally! It’s nice to be here for my birthday. I’m with my boys, sitting in Tahoe, looking out at beautiful scenery, enjoying a fire in the fireplace and cup of hot cocoa. There’s snow on the ground and a beautiful blue sky and sunshine. That’s a pretty fabulous birthday present. So I’ll enjoy my birthday (not working for a change) and another week and a half. I’ll work on getting better at snowboarding and enjoy my family. Then I’ll go back refreshed, relaxed and with my sense of perspective restored. And with a lot of sunrises under my belt. Happy (early) birthday, my dear friend. As hard as you work, you deserve uninterrupted time off. Sorry about the cost associated. I hope the 3 of you have a fantastic time. I evny you. Have a ball!